In a press release, Cebu Pacific Air launches today two new domestic routes at an introductory promo fare of Php 99.00. 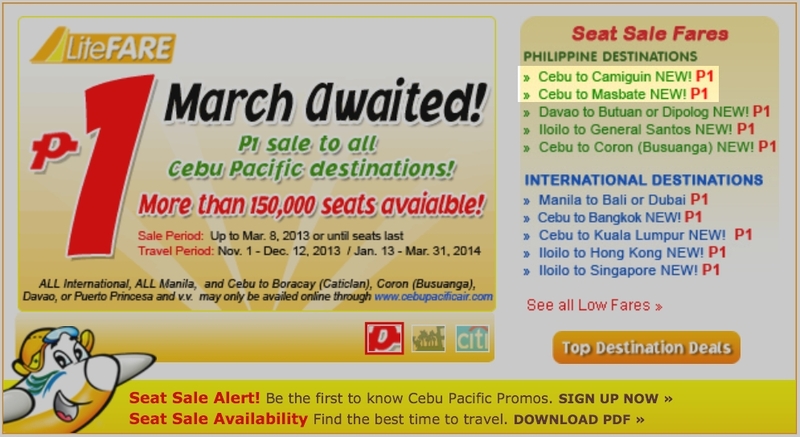 Cebu Pacific will start serving the Cebu<>Camiguin route on April 15, 2013. This route will have three flights weekly scheduled every Monday, Wednesday and Friday utilizing an ATR 72-500 aircraft . Flight 5J-833 will depart from Mactan-Cebu International Airport (CEB) at 6:45am and will arrive at Camiguin Airport (CGM) at 7:25am. The returning flight 5J-844 will depart from Camiguin at 7:45am and will arrive in Cebu at 8:25am. Cebu Pacific is schedule to have its first commercial flight serving the Cebu<>Masbate route on June 1, 2013. Flights are scheduled every Tuesday, Thursday, Saturday and Sunday utilizing an ATR 72-500 aircraft. Flight 5J-440 will depart from Mactan-Cebu International Airport (CEB) at 6:15am and will arrive at Moises R. Espinosa Airport (MBT) in Masbate City at 7:10am. The returning flight 5J-441will depart from Masbate at 7:30am and will arrive in Cebu at 8:25am. These two new routes are also included in Cebu Pacific's ongoing Piso Sale. Sale Priod is from March 7 to March 8 while Travel Periods are November 1-December 12, 2013 and January 13-March 31, 2014. Earlier in December 2012, the City of Masbate, through pia.gov.ph, made mention about the Cebu-Masbate-Cebu route to be served by Cebu Pacific. In January 2013, Camiguin Governor Jurdin Jesus Romualdo announced through pia.gov.ph that the Civil Aviation Authority of the Philippines (CAAP) gave its green light for Cebu Pacific to open a new route between Cebu and Camiguin.